2 Drop Down Leaves to extend the table top. The country cottage styling of this large scale kitchen island will give your home a custom feel at an affordable price. The spacious island features a black finish for the base with tons of built-in organization including cabinets, drawers, wine storage, hanging stemware storage and a spice rack. 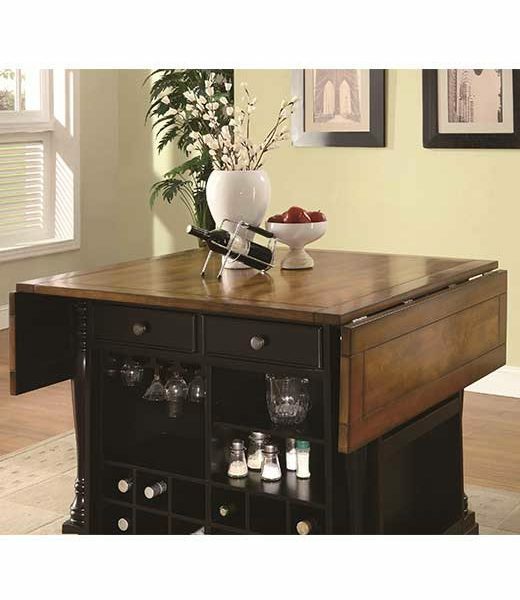 The cherry finish top has drop leaves at each end to extend the table from 42 to 66 inches long. Fold them down to save space for an efficient kitchen workflow or rise them for a food preparation space. With the leaves up, the island is also place to pull up bar stools for breakfast or a casual meal. The turned columns add to the impressive style of this versatile piece. 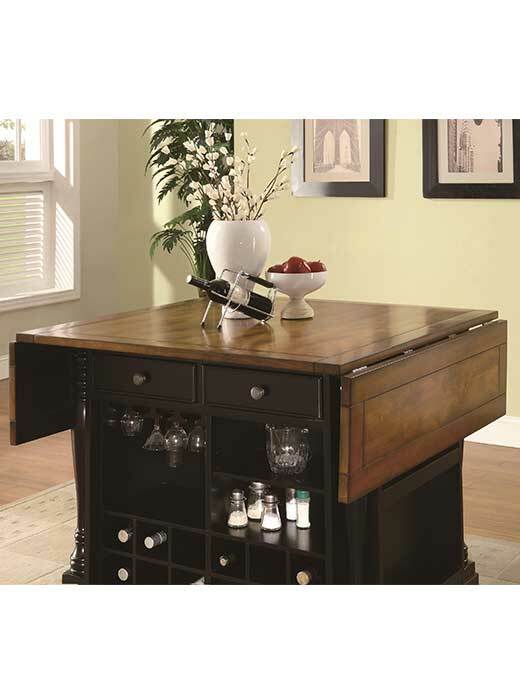 This kitchen cart collection offers trendy solutions to make the most of your cooking and dining space. 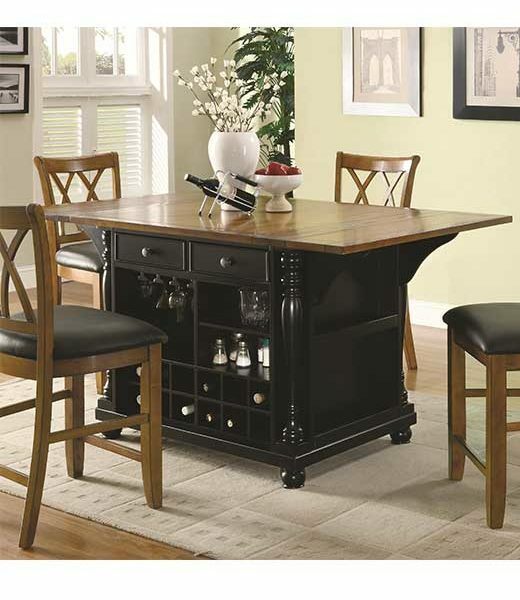 From casual and homey pieces to intricately carved and formal serving tables, it has something for everyone. Get rid of the clutter on your counter tops and add extra storage space by choosing a piece from this diverse selection of serving tables. Whether you want to stow a microwave, hide away extra dishes, or spice up your dining evenings with a formal server, these kitchen carts are visually appealing and offer convenient storage to meet all of your needs. Storage Top extends from 42 to 66 inches long with leaves. 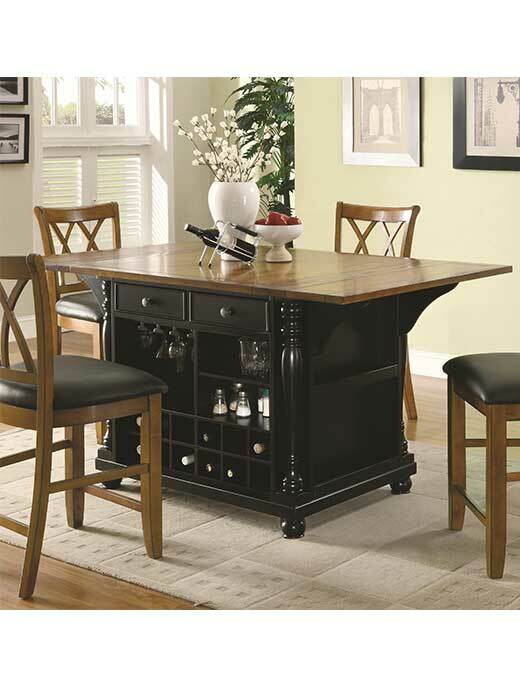 Affordable Portables is a Chicago family owned independent furniture retailer. We have 2 stores and 1 warehouse and have been open in Chicago since 1977.